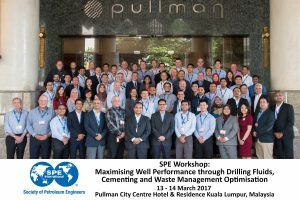 Evodos presented at the SPE workshop “Maximizing Well Performance through drilling fluids, Cementing and Waste management optimization”, recently held in KL Malaysia. During the presentation Mr. Hen Boele, CTO and patent holder for the Dynamic Settling technology, explained the Technology, benefits and operational value of the technology. All supported by the latest field demonstration results. The presentation was well received and sparked interest from various participants. The Workshop had an excellent attendance of over 75 people from various operators, service companies and equipment suppliers. We would like to thank SPE and specially Hanna-Rose Abdul Jalil as the event manager , for the opportunity and Valuable Workshop.